Maumere Bay is an extensive, beautiful bay surrounded by volcanoes and gentle hills and rimmed by islands. Maumere Bay encompasses the whole area around Maumere town, all the way to the East until Tanjung Darat and including the islands of Besar, Dambilah, Pangabatang, Babi and Pamana. Some people believe it is not worth visiting Maumere Bay for diving because the area was hit by an earthquake in 1992 with a tsunami following. Many families here have lost members and the stories are very sad, as in every disaster. 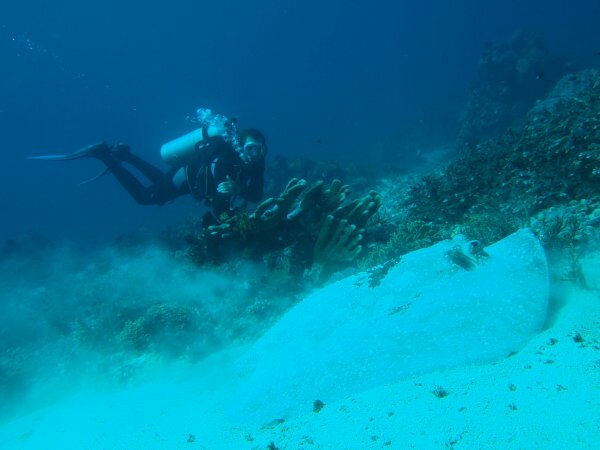 Damage on land was extensive, but underwater only a few dive sites suffered and the corals have grown back since (take a look at our gallery). There are more than 1200 species of fishes living in the bay and the variety of corals, sponges, crustaceans and molluscs is immense. The coastline of the mainland and the island is diverse and offers shelter and nursery grounds for all kinds of animals. The coast of Tanjung Darat is mainly untouched mangroves, the islands mostly sandy beaches with sea grass and coral reefs. On the mainland shore you find mainly of dark volcanic sand and rocks with mangroves and some small coral reefs. WHAT CAN I SEE ON MY DIVES? There are certain animals and certain critters which we always find again because we know their habitat and we know what they like and where they hide or feed. But mostly, people forget that as a diver you are only in the water for about one hour. The animals have another 23 hours to pass by whenever and wherever they like. Therefore we can't give a 100% guarantee that we will see sharks, rays, barracudas, turtles, groupers, bumpheads, big tuna etc. on every dive. But - yes, we have seen them all, yes, we have seen them often, yes, we swam with whale sharks, pilot whales and we were concerned when the hammerhead shark came so close to us… yes, we have seen schools of bumphead parrot fish, passing by gently and we were lucky to observe many beautiful animals as they live and swim among us. On the following list of DIVE SITES we also write, what kind of animals you might see during a dive, but this doesn't mean, we ALWAYS see them. At certain times of the year or under certain conditions we might see a specific animal very often but then again it might disappear. Therefore we also don't write which months you are likely to see a specific fish. For example: When is the season to see sperm whales? Well, mostly in November but sometimes we see them also in July or August. We are aware of global warming and climatic changes and we believe the animals also adjust and change accordingly. So let’s be flexible and take every dive as a surprise! Except one 100% guarantee: you can see a mermaid in our restaurant. Where? Search for it! For the dive sites for muck diving please click here / Photos. All dive sites on the islands are 1 to 1.5 hours by boat from Ankermi's Resort. The topography of Pangabatang island (Pangahbatan) is unique because it is at the tip of the strait between the islands and the mainland. Therefore it is the “gate” to leave the protected bay and that is the reason why we often can spot whales and dolphins here. A slope down to 30m depth, a continuous white sand bottom channel, framed by beautiful coral gardens and a steep wall continuing deep down, covered with big Gorgonian fans, sponges, hydrozoans and hard corals. Most times there is a strong current here, so there is a good chance to see big fish. Eagle rays glide in the current, reef sharks and big dog tooth tunas are spinning around, hammerhead sharks and turtles show up to hunt and hide. A large variety of reef fish can also be discovered here. In shallower waters we often find crocodile flatheads, ghostpipe fishes, ribbon eels, frogfishes, many kinds of scorpionfishes, cuttlefish, nudibranchs and flatworms etc. etc. Bumphead parrotfish often accompany the divers on their safety stop. This site usually has strong currents. Here you mostly drift along a deep wall covered with huge Gorgonian fans and whip corals, sea fans, green corals and soft coral gardens. Schools of fish gather, rays, sharks and mackerels pass by but it is also well worth to take a closer look at the macro life among the corals. Dambilah island lies west of Pangabatang island, there is a reef in front of the island, not connected to the island itself. The reef has an oval shape, long stretched, cut in two parts and offers varied land scape - steep wall, slopes and overhangs, white sand areas and coral gardens. A nice playground for fish schools and rays swimming with the current. Babi island (Pulau Babi) is not very far away from Pangabatang, in general we combine these two islands for our island trips. Babi island is outside of the sheltered bay and on the way to this “pig shaped” (babi” means pig) island we cross the open sea. Often we spot dolphins, whales, even dugongs here. Babi island has shallow coral gardens all around the island dropping to steep walls. Only in the south there is a slope instead of walls. Depths for all sites is undefined, we never went all the way down, it is too deep. Babi island was hit in 1992 by an earthquake (epicenter just 4km north of the island) which caused a tsunami and a lot of the people living on the island lost family members, cattle and homes. Two villages were washed away by up to 10m high waves. The villages were resettled on the mainland by a government project, but many people have come back to their island, because after all they are fishermen - bajo tribe-people who live from and by the sea. The crack is the most visible remain of the earthquake of 1992. The reef has been ripped apart here, a crack of about 50cm width has been formed and you can follow it all the way towards the beach. As a diver you can see, that the crack widens deeper down and forms a small cave from where you can see all the way to the surface. Corals grow in it and a lot of reef fish find shelter here. After a close look at this testimony of earths forces we continue the dive on a steep wall, full with coral growth, mostly hard corals, large sea fans and many fishes darting around. As we look down into the depths we can spot reef sharks and rays. The wall also hosts many kinds of smaller life like nudibranchs, leaf scorpionfishes, eels and morays, octopus, lobsters and the resident frogfish or two. The steep wall from The Crack continues towards the north side of the island. A deep ledge, located around 35m, with a cave below an overhang (too deep to go down). A great spot to see white tip reef sharks, nurse sharks and if you are lucky a hammerhead shark. Turtles also often feed on the sponges growing on this overhang. After the ledge the dive continues on a steep wall. Gorgonian fans are waving against the current on this slope which is part of Babi island. Tunas, schools of mackerels and red tooth triggerfish are spinning around this site. A good place to find Gorgonian (pygmy) sea horses and frogfish. This is a slope and a mini walls going east from the village on the south side of Babi island which was hit most heavily by the tsunami. Variable bommie formations, mini walls and a platform, a diverse habitat for all kinds of marine life. Apart from different species of rays and reef fish we spot the highest number of reef sharks here. Macro lovers can’t get enough when finding mantis shrimps, ghostpipe fishes, frogfishes, pipefishes, pygmy seahorses, shrimps, eels, nudibranchs etc. Pulau Besar, the biggest island of Maumere Bay is connected to Pangabatang and Dambilah with only small channels in between. This dive sites starts with a slope, then a platform on about 14m and continues to an endless wall (40m down or more). Giant sea fans, soft corals in all shapes and sizes, anemones, black coral, hydrozoans, a wide selection of sponges and different species of hard coral. Butterfly fishes, emperor fishes, ghostpipe fishes, different nudibranchs, turtles, bumphead parrotfishes etc. This is the place for big schools of mackerels and tunas, spinning around you but it is also nice to enjoy the lush coral growth in the shallow parts. Similar condition as the Maragajong dive site (see above), stunning walls overgrown with corals and big bommies, sea fans, hydrozoans, gorgonian fans and sponges. Schools of mackerels and several species of tunas, sharks, big groupers and sweetlips can be seen passing by. On Easter 2008 we found a very interesting new dive site. More exploring needs to be done, it is a spot full of surprises with possibly strong current where you can enjoy wall covered with corals and big fish all around and we call it THE EASTER EGG (No.6). We descend from a mini wall and pass a big bommie situated on a platform on 18m and continue down to a steep wall which “floor” you can't see. This dive site lies across the strait from Pangabatang in Tanjung Darat. Therefore the currents are often strong and the big fish are passing on their way in and out the bay. You will find big groupers and sweetlips, several species of bannerfishes and butterfly fishes. 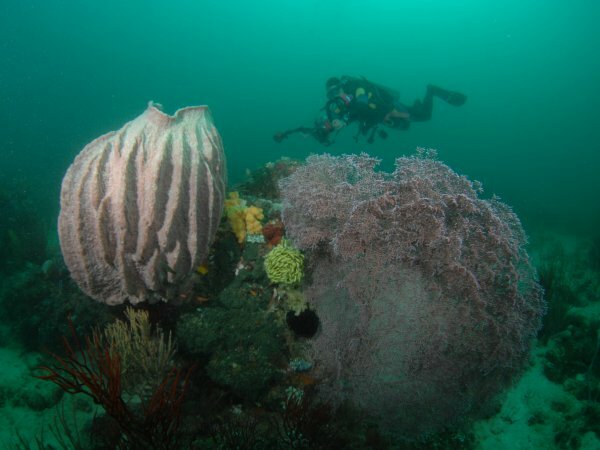 The wall is covered with black corals, hydrozoans and sponges as well as many species of hard corals. Octopus, blue spotted stingrays, eels, morays, nudibranch, shrimps and many more animals find shelter here. Back on 18m- 14m there is a platform with large coral formations, bommies, sponges and table corals with baby sharks sleeping underneath. A good place to drift with the current and search for scorpionfishes, leaf scorpionfishes, barramundi cods, mandarin fishes, pygmy seahorses and cuttlefish, just to name a few. This dive site is situated further along where the strait leasdds to open water and is therefore well known for the chance to do whale watching (sperm whales, fin whales, sometimes in July- August or November). The dive site starts from a shallow coral garden with beautiful hard and soft corals and many squids, down to a white sand channel - the perfect place to see sleeping sharks and big rays - where blue razor fishes, flounders, garden eels, lionfishes, sea pens and sea stars live and then continues to a steep drop off starting at 18m depth. Here you can search for lobsters, octopus, frogfishes and other small animals, but it is also possible to sometimes observe turtles feeding on sponges, or a leaf scorpionfish and blue ribbon eel posing on top of the sea mount on 12m. After the wall, the dive continues to the platform with the coral garden with many different hard and soft corals. Anemones and their clownfish, morays, orangutan crabs, nudibranchs and a big selection of reef fish etc. These dive sites are very far away, divers need to get up early and we need four people minimum to do this trip. The dive sites around Pamana Island are mainly walls and slopes. There are growths of sponges, soft coral, and fans being host to little reef fish. It is quite common to see reef sharks and eagle rays, groupers, sweetlips, nudibranchs, scorpionfishes, lobsters and much more. Beautiful drop off with caves and caverns where baby sharks hide and sleep, lots of trevallys, rays, groupers, sweetlips, batfish, nudibranchs and the usual coral inhabitants. This atoll lies far out in the open sea and it is therefore not easy to reach. Currents here are very strong, the waves often high so it is not possible to dive here all year around. We only go there if the conditions allow it and we have a large enough group of divers. Pasir Sari is the local name for the Gosong Bone Atoll and on its Southwest side stands a broken light tower, which was installed shortly before the earthquake in 1992. When the quake hit the area, the light tower broke and hasn't been repaired since. Descending you pass a 6m- 10m deep platform and then continue to a seemingly endless drop off. The wall has several caverns and if the current is mild it is a perfect place to find macro life - we found a oversized Spanish dancer (Hexabranchus sanguineus) during the day. With stronger current you have nothing to do than watch your air supply and the big fish like manta rays, devil rays, big sharks, schools of dog tooth tuna, mackerels etc. passing by. In the mid 90’s we started exploring around Ankermi’s river beds, mudflows, sand, rocky areas, algae fields and sea grass fields. What we found there was incredible - Ambon scorpionfishes, mimic octopus, wonderpus, bobtail squids, frogfishes, skeleton shrimps, wasp fishes, ghost pipe fishes, pipe horses, seahorses, special scorpionfishes, flying gurnards, several species of dragonets, bobbit worms and many more critteres were living in the muck just on our doorstep! Kermi became a specialist for the rare critters and their juveniles and many of his friends call him the “eagle-eyed” Kermi, because no critter can hide from him. He started filming underwater videos to gently document the behavior of these wonderful critters. Night diving for hours in the muck has become his passion and he is always very happy to meet people who are addicted to it as well. Many critter lovers from all over the world are visiting us for our muck. We also love to introduce people to muck diving who have never tried it but would like to know more about it. We were looking at the nature above the water and around us. There is forest, swamp, desert, rocks, etc. In all these places live different species of animals. Every animal has it’s preferred habitat to live where it can survive the best. We were thinking that under the sea it must be similar. There can not only be life in the corals! Actually marine life on sand and rocks is as interesting as life in a coral reef but here the animals can be observed much closer and in more detail. Muck diving here is ideal for photographers, offering a great variation in rare and well camouflaged animals. Take your macro lens along and be surprised! The muck dive sites all lie nearby Ankermi Happy Dive Resort in a secluded bay which we call Ankermi's Bay and which is part of the larger Maumere Bay. So far Kermi and Claudia have discovered about five different dive spots only for mucking. You dive mainly on fine, dark volcanic sand, mud and earth in an area between two river mouths. 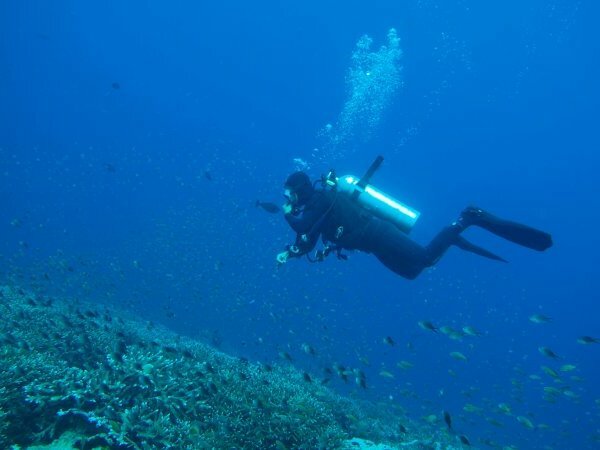 All dives are always accompanied by our experienced dive guide. Until 2007 Ankermi Resort was located in Wodong, two kilometers further to the west of the new Resort. The sandy area in front is the perfect habitat for the mimic octopus, flying gurnards, fingered dragonets, demon stingers, frogfishes, dwarf stonefishes, mantis shrimps, flounders, seahorses and other rare critters. This place is not only famous for the great muck but also for night diving. Bobtail squids, all sorts of octopus, squids, cuttlefish, crocodile flathead juveniles, nudibranchs, slugs, flatworms, shells, arrowhead crabs, shrimps etc. can be spotted here at night. Night dives are so interesting, that you want to prolong it for as long as possible even if you start shivering long before you go up - but don't be afraid - Claudia is willing to boil hot water for the wary night diver, so you can warm up when you come back from a long night dive! This dive site is easily combined with the wreck and is a great place to observe the mandarin fish. You can also start at the actual reef so you have enough time to wait for the mandarin fish to come out. This is a small reef easily reached from the shore. You dive on a gentle slope with growth of sponges and corals that give shelter to many different animals: shrimps, trigger fishes, cuttlefish, morays, lobsters, nudibranchs and much more. In the reef around it live among other fishes also stonefishes, several ribbon eels and often ghostpipefishes. Close to Nangahale village there is a new dive site we started to dive in 2009 and our guest Zubi found a shaggy frogfishes (Antennarius hispidus) after only 5 minutes diving. So we named it after her and her favorite animal (see www.frogfish.ch). It is a true muck site with sand, mud and some garbage and with visibility usually not so good. Aside from frogfishes there are also a lot of other critters like large seahorses, octopuses, nudibranchs, small pipefishes, coconut crabs, lots of sea cucumbers and slugs. The local oil company lies about 5km away from Maumere town and it is not always possible to get permission to dive their jetty and the surrounding area. Under the pier of the oil company it is mostly muck diving and on the pillars there are sponges and soft coral growing. There are juvenile wrasses feeding around the jetty pillars while a frogfish is hiding between concrete and coral. In the muck and the slope there is a lot to see - scorpionfishes, stonefishes, flatheads, flounders, dragonets, etc….. This is a busy place with fishing boats and canoes, people coming in with their catch and selling it on the fish market (pasar ikan). We dive to the side of the jetty on a slope where there are usually no boats overhead. This is mainly a muck dive site, a seahorse has been spotted here which was the size of a 1,5lt Aqua bottle, mating frogfishes have been seen here, dragonets, devil fishes, morey eels and sea moths etc. The Wairterang wreck is located close to the Ankermi Resort. This is a Japanese ship-wreck from the World War II, we don’t know exactly if it was a freighter or a controller. Wreck specialists have been diving with us checking out the wreck in order to find a registration number. Unfortunately the ship lies twisted, so the number might be buried in the sand, and the specialists said, that the ship is not registered. The oldest men of the village have told us the story that the crew was taking water from the Wairterang spring near by and then the ship was bombed from air and sunk. The wreck lies on its side from 12m–32m depth, it is twisted and iron spruces and doors are clearly visible, some overgrown with hard and soft corals. Schools of trevallys, mackerels, groupers and batfish swim around its surface and the wreck is a perfect hiding place for all kinds of marine animals: Mantis shrimps, octopus, scorpionfish, stonefish, lionfish, twin-spot lionfish, different nudibranchs, pipefishes, morays, ghostpipefishes, frogfishes and a large variety of shrimps. IMPORTANT: Spearfishing is prohibited in Indonesia and not tolerated by us! Collecting of marine specimens from our marine environment is forbidden!